Flags Of Valor from Redline Production & Post on Vimeo. 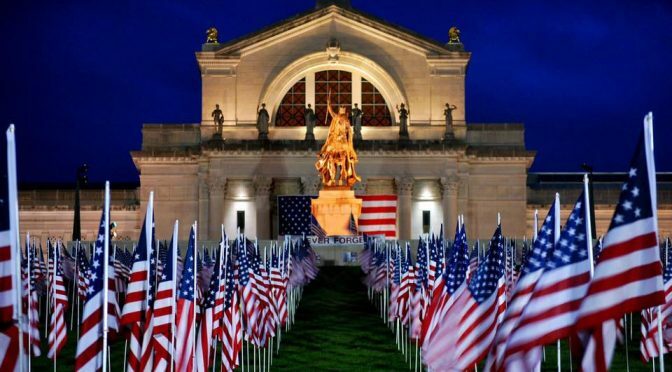 On 9-11-2016, America’s Heartland Remembers (AHR) will fill Art Hill – the iconic St. Louis destination in Forest Park – with nearly 7,000 American Flags. This awe-inspiring display, which will be known as “Flags of Valor” will pay tribute to the brave men and women who made the ultimate sacrifice while fighting the War on Terror since 9-11-2001 to keep us free and safe here at home. Each and every flag will bear the name and photo of those who so bravely served their country, but never came home. The flags will be placed in chronological order according to the date they lost their lives and will allow loved ones and visitors to walk through the massive display so they can easily find and honor each hero. AHR wants to ensure Gold Star Families have the opportunity to bring their Hero’s flag home. Family members can acquire their Hero’s flag at a reduced rate by visiting FlagsofValorUSA.com. Here, they can also search for the location of their Hero’s flag on the Art Hill prior to the September 11th weekend event. Additionally, members of the general public can sponsor a flag for a Gold Star Family, as well as acquire an unclaimed flag for a small donation. Apart from helping America’s Heartland Remembers fund two memorials for a fallen New York firefighter and a Marine from Iowa, all profits from the event will be donated to four (4) not-for-profit organizations that are closely aligned with the mission of America’s Heartland Remembers one of which includes the Missouri Military Memorial Foundation.